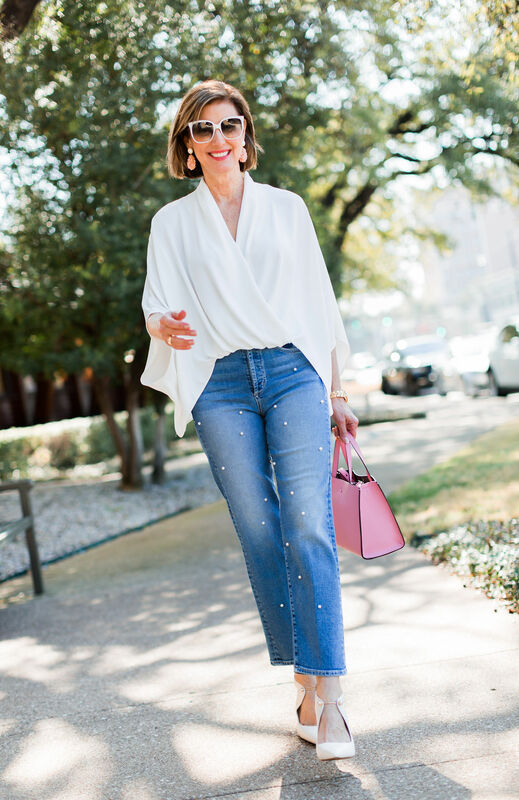 Not So Boring Denim - Boho Chic - Fashionomics "every page"
Happy Wednesday and hope you are having a great week. I’m writing this from Memphis where I am having some Dee Dee time with Hunter and Jennings. They change so much every time I see them. This spring has been so busy and I guess that’s a good thing but I need to take some time to change over my closet as soon as I’m back in town. It’s hard to get dressed when everything I need is in the off season closet upstairs. My clients have been keeping me busy and I am very thankful for that. 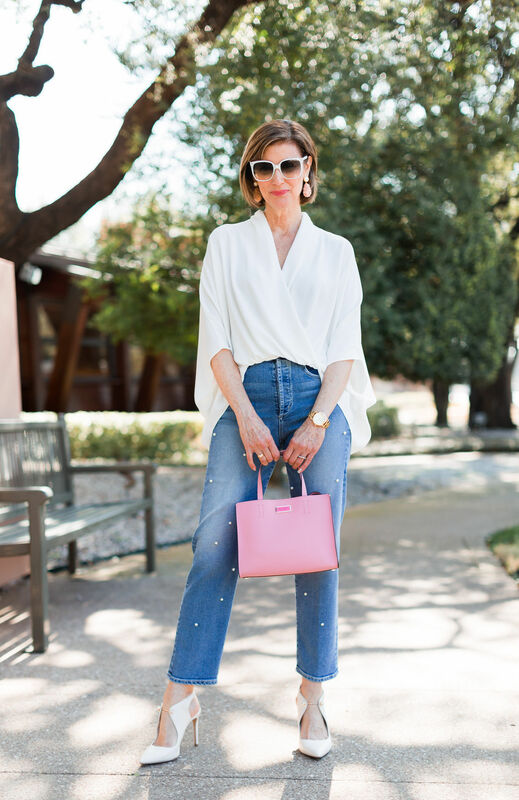 I’ve got another great look from Tootsies, my fave boutique in Dallas. 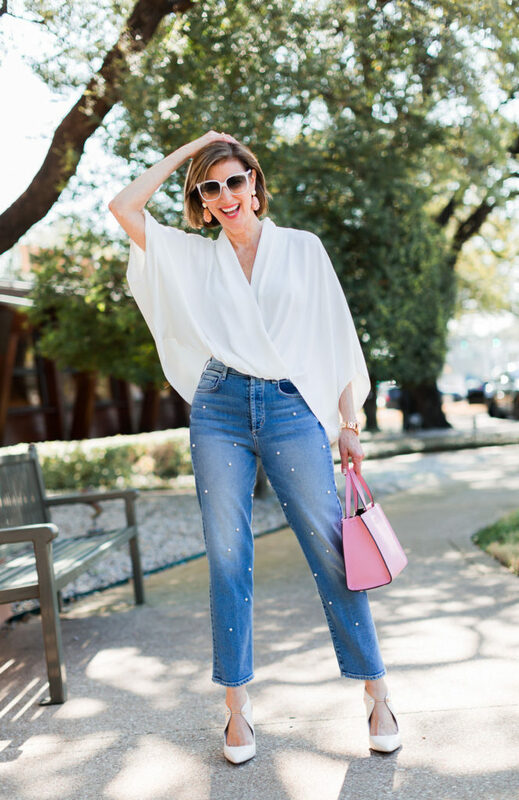 I wanted to write about not so boring denim with a boho chic flair. 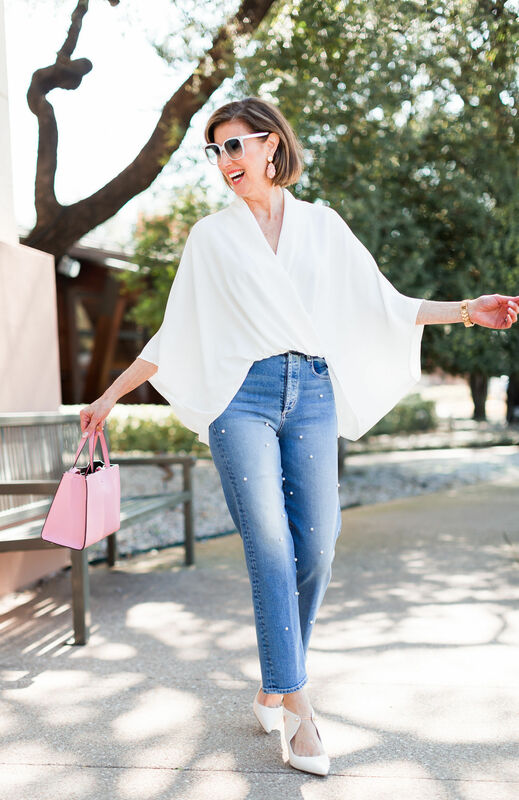 Denim has become a staple in our wardrobes and embellishments like pearls add a special flair. 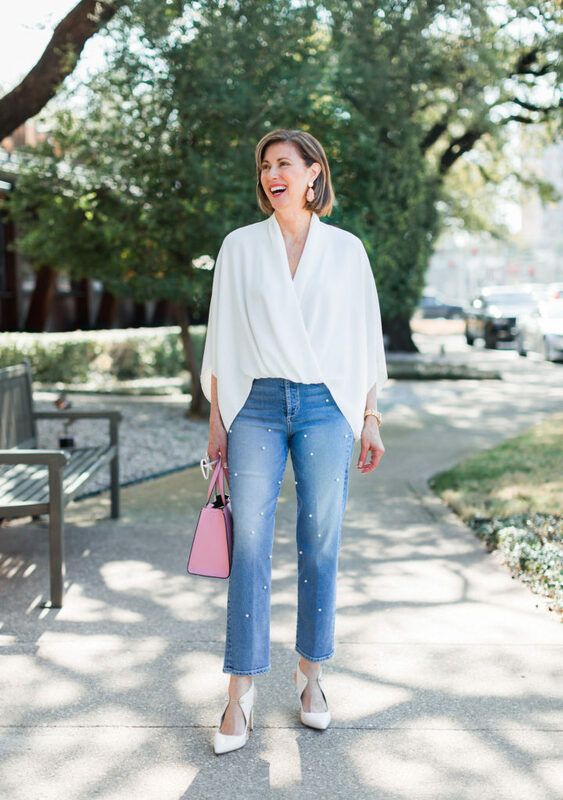 McGuire makes a great high waisted version of jeans with pearls. 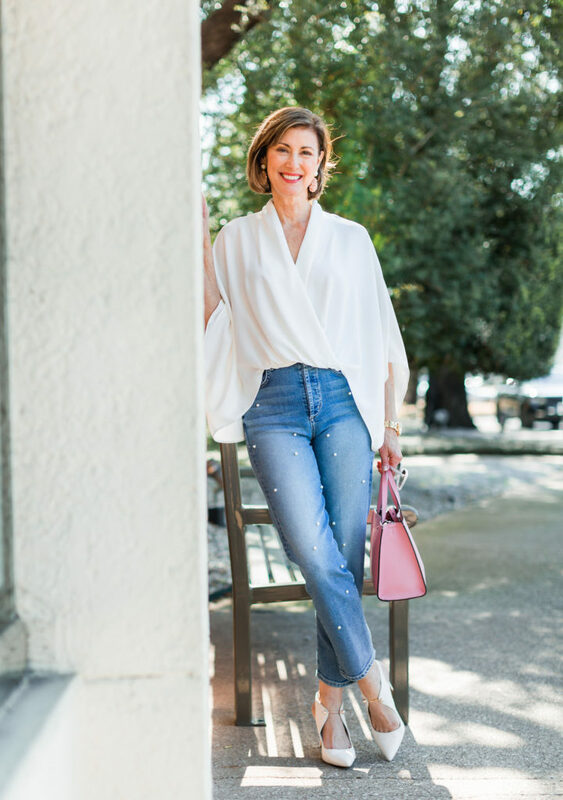 Dressing up your denim with a heel like this off white one with gold and pearl detail from Louise et Cie is quite the norm these days. I love a cropped jean that shows off your shoes. Boho Chic is kind of a stretch for me since I am usually pretty classic in my style. 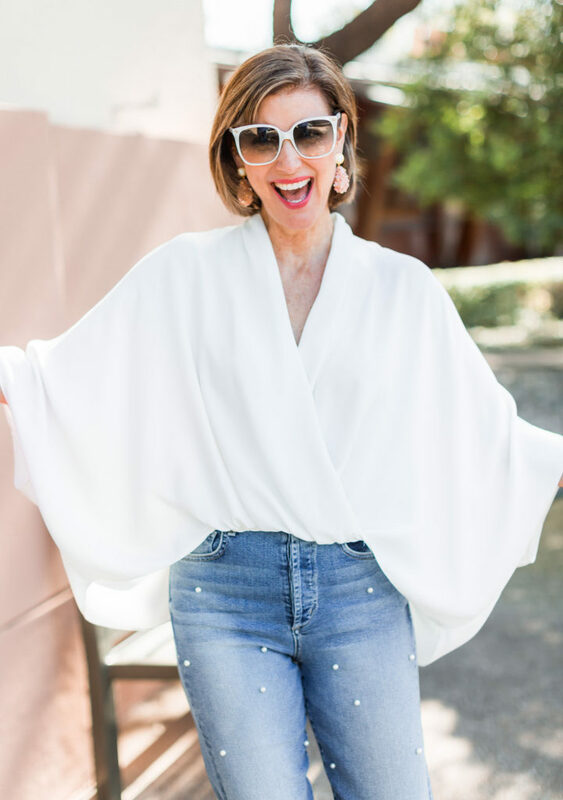 However I do like to add some interesting pieces to my wardrobe and this white Trina Turk Drapey Cross Over Top is just prefect with this high waisted jean. White is always a great choice in my opinion and it just says spring and summer. This top could be dressed up with a pencil skirt and looks great with jeans as well. White shoes have stood the test of time and I have worn these all year round. There are so many fun accessories these days. 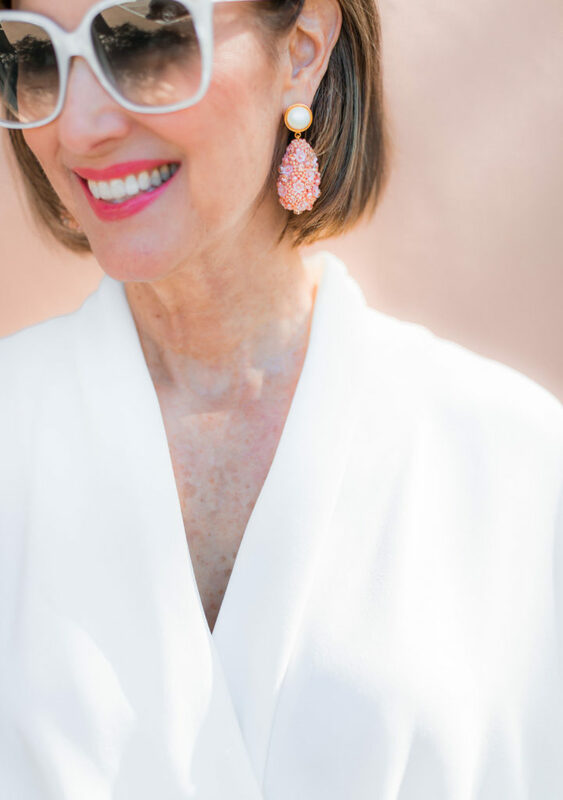 I am obsessed with these Lizzie Fortunato earrings. She is so creative and her prices are really great considering the amount of work in her designs. If you look closely you will see that the drop is made up of flowers, beads and a little sparkle. 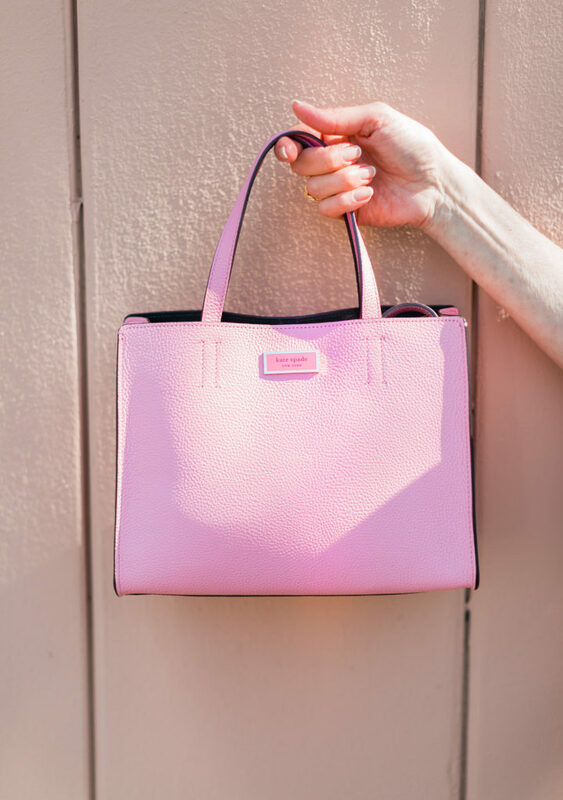 Pink is so on trend this year and we chose this Kate Spade top handle bag for a pop of color and it kind of coordinates with the earrings. 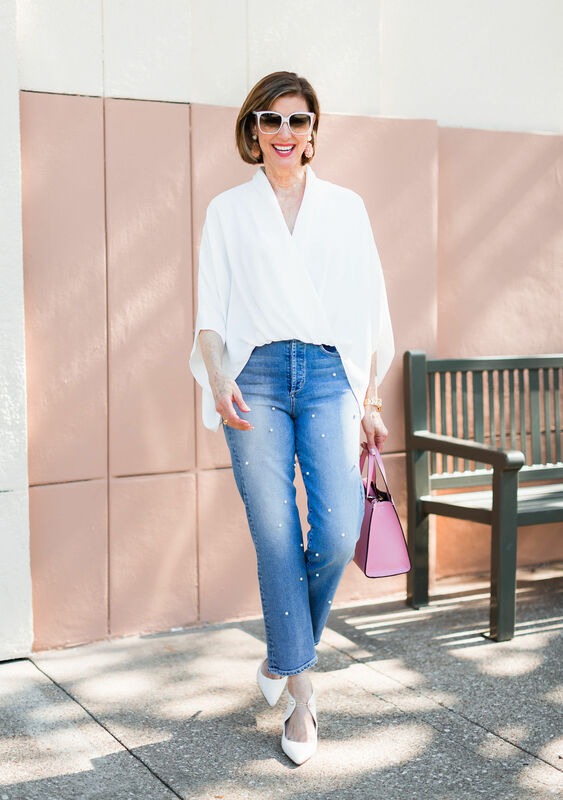 White shoes are still on trend and a blogger can’t possibly shoot without some stunning sunnies like these white pearl frames from Gucci. 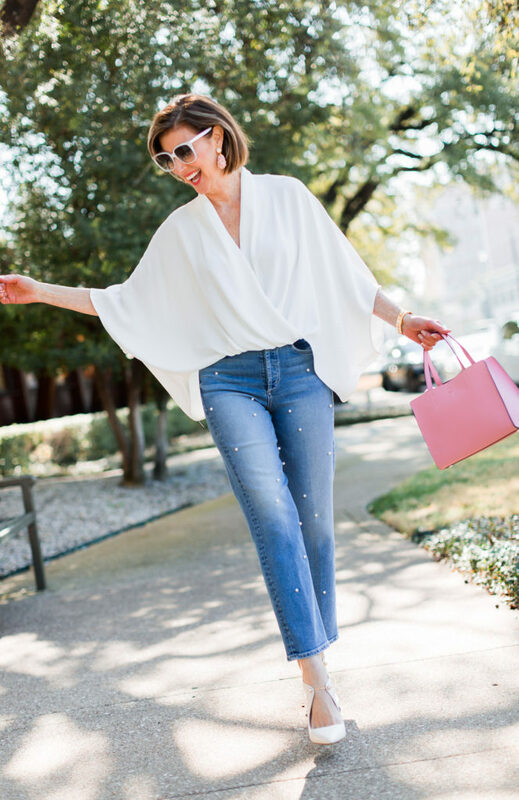 Jeans with pearls and pearl detailing on the pumps; dressing up your not so boring denim.